After a gap change ensure you tighten the eye bolts to lock the rollers in place. Hopper needs to be bolted together. Base needs to be bolted to mill. Mill needs to be bolted to hopper. First cleaning: These are brand new mills and do have oils leftover from the manufacturing process. Simply run a handful of grains through the mill and discard the grains. After too long, and a bunch of work, Monster Brewing Hardware now has a base and hopper to go with their mills. Finally, you can purchase our mill, and hopper/base system, and in a matter of minutes after taking it out of the box, be able to mill grain. No more fabrication required! 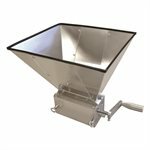 The hopper is constructed from 20 gauge G90 hot dip galvanized steel that should never rust. The material is more than 35 thousandths thick, and is super strong! The pieces are laser cut, and then CNC bent by our supplier in the USA. The hopper stands 9” tall above the mill, and the opening at the top is 11.5” by 12.75” with a capacity of at least 11 pounds of 2-row or pilsner malt. The hopper design directs the grist down into the mill gap, keeping it both away from the ends of the rollers, and from bouncing out of the gap. In testing there were no problems with positive feeding. The main six hopper parts are the same for any of our mills, while the sides that hold the hopper are different for each mill, and double as covers to keep the grist below the base. Because the parts are built very accurately, the holes line up perfectly. The whole works assembles easily in minutes with the included #8 machine screws, washers, and nylon insert lock nuts. We include nylon insert nuts so they won’t vibrate loose while milling. 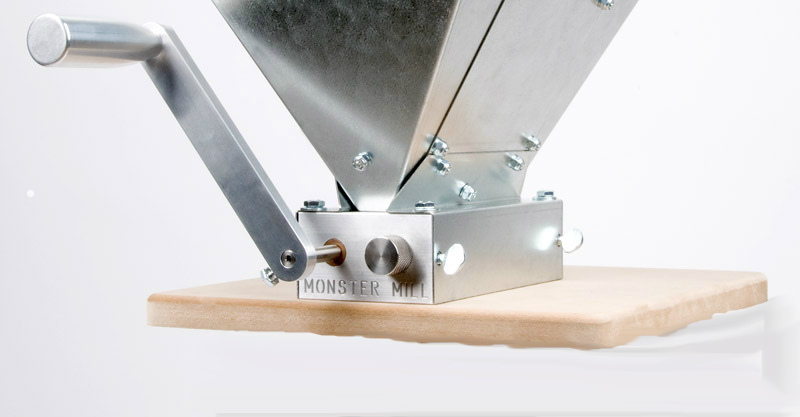 The hopper mounts to the top of the mill using the included ¼-20 half inch long mounting bolts. If you had an erector set when you were a kid, the process should bring back fond memories. (hopefully!) The only tools necessary for assembly are a Philips screwdriver PLUS an 11/32” box end wrench, socket, or a pair of pliers. The base is hand fabricated by a local cabinet maker from medium density fiber board, and measures just under 12” x 12”. The top edges and corners are radiused for smoothness, and the window for the grist to fall through is hand routed. The base fits over standard 5-6 gallon plastic buckets, and holds the mill frames straight and securely.